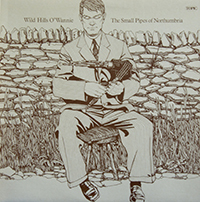 The Wild Hills O’Wannie is a tremendous collection of some of the finest exponents of the Northumbrian Small Pipes – George Atkinson, Diana Blackett-Ord, Tommy Breckons, Colin Caisley, Forster Charlton, Joe Hutton and Billy Pigg. The pipes have at various times been called seductive, wild, plaintive, lyrical, exciting, and sophisticated. These apparently contradictory descriptions result from the unusual versatility of the instrument as well as from differences in the tonal quality of individual sets of pipes. Thus, it is possible for each performer to develop his own characteristic style of playing and if you listen carefully to this record you will soon become able to identify the player from the sound of the first few notes of a tune.